The Padilla Signature 1932, 1948, and Miami 8&11 blends are seemingly everywhere. Because they are (or were) crafted by Don Pepin Garcia, they get all the ink and the B&M shelf space that goes with it. And then there’s the Padilla Habano. Despite having been around since R.T.D.A. 2005, it gets little buzz on the boards. Even the Padilla page on Cigar Live, where Ernesto sometimes posts, doesn’t have a single thread dedicated to the Habano. It wasn’t until a couple of weeks ago that I even found a B&M that had a full box on hand. I can only assume the Habano line has a low profile because it was not made by DPG. Instead, the blend is the collaborative work of Ernesto Padilla and Gilberto Oliva. This Nicaraguan puro is rolled in only three sizes, Robusto, Churchill and Torpedo, at Tabacalera Fernandez in Esteli. These are nice looking sticks. 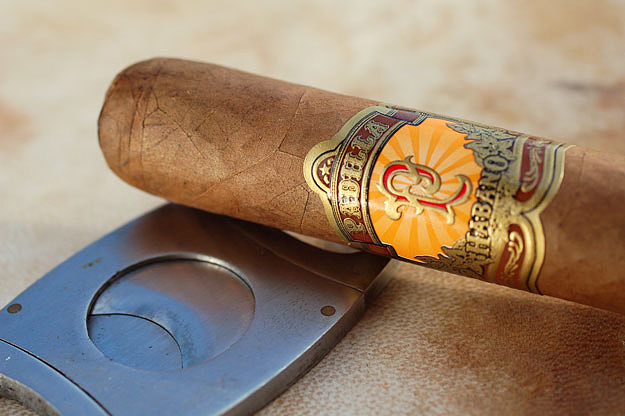 The wrapper, a five year-old Habano from the Oliva estate, is nut brown, smooth and slightly oily. Most tantalizing, however, is the abundance of jet-black ligero filler visible at the foot. This one impresses from the start. While it’s not particularly strong at the outset, the flavor grabs my attention nonetheless. It is rich and nutty, with leather and spice in the background. The dry, leathery finish briefly reminds me of a a DPG blend. Those similarities fade after an inch or so, however, as I pick up some earth and the first hints of powdery cocoa. Around halfway, the cocoa becomes more pronounced and the spice builds steadily. None of the initial flavors have faded. Instead, an already good cigar becomes increasingly complex. The balance is such that the power sneaks up on you. On the final third, I realize that this has gone from a medium body to full-on strong. Still pleasant, but a good bit more assertive than the first half. The draw is excellent throughout, while the burn is average. And now for the bad news: I ran into consistency problems with the blend. I smoked three of these to write this review (though my tasting notes are based mostly on the first one). None were exactly the same. One, which appeared loaded with black ligero, was indeed spicier but less complex than the others. The final one was heavier on the nuts and leather, and didn’t develop the really cool cocoa flavor until late. All were good. But the inconsistency holds me back from buying a box. I’ll try a few more singles to see if I got some flukes or if this blend is really all over the lot. CONCLUSION: Even after three of these, I’m unable to say anything definitive. At its best, the Padilla Habano easily rates in the 90s. The least of the three was no worse than an 85. For a puro, there are a lot of flavor components going on here. In fact, there’s something for just about everyone — ample but not overpowering strength, warm flavors, pleasant spice and balance. If I could be assured that consistency isn’t a fatal flaw, I’d be all over these at $6.00 per stick. I can only suggest that you (a) try them, and (b) pick up more than one for comparison. Great review. I used to love these when they were being made at Tabacalera Oliva. Since they switched to Tabacalera Fernandez I have noticed that the consistency is lacking. I used to buy these pretty consistently up until last year when they made the change. Since the change I purchased two boxes and the inconsistent flavor was from stick to stick, not just box to box. Real bummer these use to be my favorite budget smokes. Hey, Jeremy. Thanks for the info. In a sense, I’m relieved to hear someone else had the same experience because as I was smoking these, I thought my palate had gone haywire. Each smoke was SO different from the one that came before. Really odd. I think it is because the blend was created somewhere else (Oliva Factory) and was switched over to another(Fernandez) they had to tweek it a bit and still don’t have it quite down yet. The tobacco just isn’t of the same quality it seems. BTW there are online vendors out there that if you buy these by the box they are around $3 a stick. Helluva shame, but that’s similar to my experience. I didn’t get any bad ones, per se, but they were all over the lot. Glad to know my palate wasn’t deceiving me!